For more than 55 years, local historian Leonard McKay assembled a distinctive body of work comprised solely of historic paintings by Santa Clara Valley artists. McKay began collecting as early as World War II when he served with the U.S. Army First Infantry Division in Germany after the Battle of the Bulge. While overseas he collected several European art works, however by 1960 he began focusing exclusively on work created by Santa Clara Valley artists. 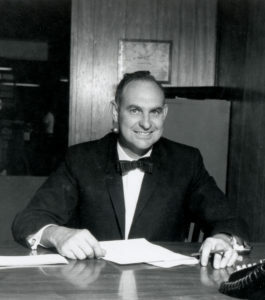 In 1956, McKay purchased the Smith-McKay Printing Company from his grandmother Bessie Smith, who founded the company with her husband Clifford, and her son Leonard Sr., in 1919. One of McKay’s clients was the de Saisset Museum. While working with the Museum’s Director Father Joséph Pociask he met numerous local artists and began collecting their work. McKay began attending art exhibitions and auctions to build the collection. Sometimes he purchased pieces outright, and other times he traded printing work for them. He said, “One of the things I like so much about these paintings is that they are a record for San José.” The resulting collection is wonderfully rich, diverse in styles and is indeed a record of San José that the Museum is proud to share with the public. This collection has not been exhibited since 2010 when History San José celebrated the 5th anniversary of opening the Leonard and David McKay Gallery. While the McKay Collection is the basis and inspiration for this exhibition, additional works from the permanent collection have been added by the same local artists to enhance and expand appreciation of their artistic legacy. The Pasetta House was moved to History Park in 1985. Thanks to a generous gift from the Pasetta family, restoration of the house began in 2004; the building was dedicated in 2005. Leonard McKay was instrumental in planning this space as a gallery with climate control and lighting that would meet museum standards suitable for exhibiting art and artifacts. This generosity has afforded History San José the opportunity to host multiple exhibits and to display countless works from its collection. History San José wishes to thank these families for their significant and permanent contribution to History Park and to the community. A native of Los Gatos and World War II veteran, McKay ran the Smith and McKay Printing Company in San Jose until 1983, when he sold ownership to his son David. From 1986 to 2003, he operated Memorabilia of San José at 250 West St. John Street. In the 1960s, he began collecting paintings by local artists such as A.D.M. Cooper, Andrew Putnam Hill, and Louis O. Lussier. Passionate about local history, McKay was active in the Santa Clara County Pioneers, History San José, and the Sourisseau Academy for State and Local History.